What are some amazing facts about Google or Microsoft? We have all come across the ubiquitous captcha - the colourful images with distorted text - a reverse Turing test of sorts. These work because no algorithm at present can read distorted text as well as we humans do. However not all the distorted texts are unreadable by machines. About 200 million captchas are solved everyday, amounting to more than 150,000 hours of work each day. Considering the numbers involved, a safe captcha generation system was needed. Enter Google reCAPTCHA. To make a positive use of this immense human effort, the reCAPTCHA channels the effort spent solving captcha online into "reading" books. are photographically scanned, and then transformed into text using "Optical Character Recognition" (OCR). The transformation into text is useful because scanning a book produces images, which are difficult to store on small devices, expensive to download, and cannot be searched. The problem is that OCR is not perfect. 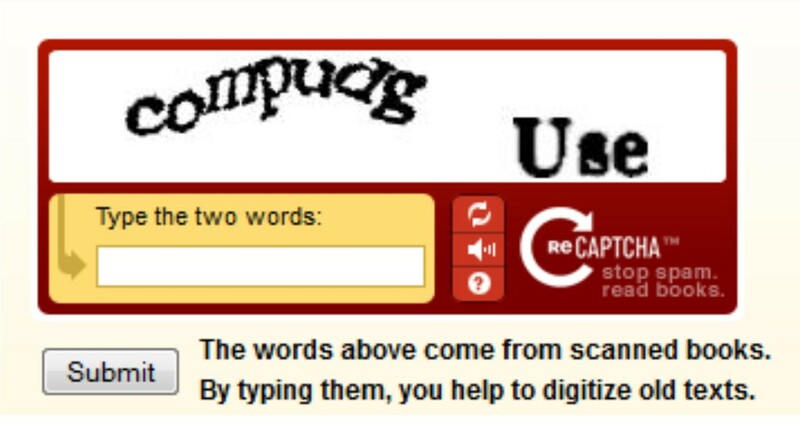 reCAPTCHA improves the process of digitizing books by sending words that cannot be read by computers to the Web in the form of CAPTCHAs for humans to decipher. More specifically, each word that cannot be read correctly by OCR is placed on an image and used as a CAPTCHA. This is possible because most OCR programs alert you when a word cannot be read correctly and this also ensures that the image is unreadable by machines. The system has been reported as displaying over 100 million CAPTCHAs every day, and among its subscribers are such popular sites as Facebook, TicketMaster, Twitter, 4chan,CNN.com, Craigslist, and StumbleUpon. The Google reCAPTCHA project is astonishingly elegant and amazingly simple! The reCAPTCHA was originally created by Luis von Ahn, Ben Maurer, Colin McMillen, David Abraham and Manuel Blum. Google acquired it on September 16, 2009 for $27 million. Thanks to Aniruddha for pointing it out in the comments. Sometimes you wonder if they should have kept the entire project details a secret, though Google issued a statement saying that any such attack to misuse the reCAPTCHA project would require much greater numbers.